Under a letter of intent signed by officials from Berlin’s Androscoggin Valley Hospital, Littleton Regional Healthcare, Colebrook’s Upper Connecticut Valley Hospital and Lancaster’s Weeks Medical Center, the hospitals will affiliate under a common parent organization that would serve all communities in New Hampshire's North Country. Officials said the agreement came after a year of talks to explore affiliation, which they see as a means of helping them all tackle the challenges faced as small, rural, community hospitals. “We’ll be stronger together,” added Littleton Regional CEO Warren West. Under the arrangement, each of the hospitals would give some of its autonomy to the parent organization, a move that would enable joint development of a coordinated health care network that will improve quality, increase efficiencies and lower cost of health care delivery in the North Country. According to Weeks Medical Center CEO Scott Howe, each organization’s assets, including charitable endowments, will remain in their respective community. Also under the agreement, each hospital’s board of trustees will continue its community oversight role, and, in coordination with the new parent organization, establish strategy and set direction for each hospital. In addition, Each hospital’s relationships with its physicians, patient care staff and employees will remain largely the same. 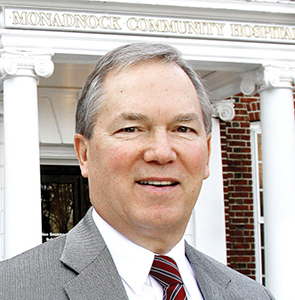 “We see this as an innovative, local, North Country solution to both meet the challenges we face and maintain four, locally oriented, community hospitals,” said Russ Keene, CEO of Androscoggin Valley. But all of the details have yet to be hammered. In the coming months, the hospitals will be develop a working agreement, which, pending approval, would lead to the formation of the new parent organization in 2015. The hospitals plan to hold community information meetings in each hospital community in August to outline what the proposal entails and answer any questions people may have.